In this article for TYT, contributor Allan Wall breaks down the recent state election results that could foreshadow the 2018 race for president of Mexico. On June 4th, 2017, four Mexican states held elections. Those states were Veracruz, Nayarit, Coahuila and the State of Mexico (Edomex). Veracruz is located on the east coast of Mexico. (To see on a map, click here.) At stake in Veracruz were the ayuntamientos of the state’s 212 municipios. (In a Spanish-speaking country, the municipio is a municipality with the surrounding land under its jurisdiction, in the United States it would be like the combination of a city and a county. The ayuntamiento is the mayor and council which governs the municipio, the city government in other words). The PAN (Partido Acción Nacional) and the PRD (Partido de la Revolución Democrática) were united as a two-party coalition in this Veracruz election, and that coalition won 112 municipios. The PRI (Partido Revolucionario Institucional) and the Green Party (Partido Verde Ecologista de México) won 36 municipios. The Nueva Alianza won 18, while MORENA (Movimiento de RegeneraciónNacional) won 17. Movimiento Ciudadanowon 9, Partido Encuentro Social won 6, while the Labor Party (Partido del Trabajo) won 4. Three municipios were won by independent candidates. And, although the PRI and Green Party ran in coalition in most municipios, The Green Party won 4 on its own while the PRI won 3. At stake in Nayarit were all the ayuntamientos, the state legislature and the governorship. The two principal contenders in the gubernatorial race were coalition candidates. The winner, with 38.66% of the vote, was Antonio Echevarria Garcia, heading up the four-party coalition known as “Juntos por Ti” (Together for You). The four parties in that unlikely coalition are the PAN, PRD, the Labor Party (PT), and the Partido de la Revolución Socialista (Party of the Socialist Revolution). In second place, with 26.82%, was Manuel Humberto Cota Jimenez of the “Nayarit de Todos” (Nayarit of Everybody) coalition, composed of the PRI, Green Party and Nueva Alianza. The same coalition (Juntos por Ti) which won the governorship won 10 of the 20 municipios, while the PRI on its own (not part of a coalition) won 6. In the state’s unicameral legislature, the Juntos por Ti coalition won 15 of the 18 seats elected directly, with the other 12 seats to be chosen by representación plurinominal, that is, based on the proportions of the vote won by parties. Coahuila is located in northern Mexico, bordering Texas on the U.S. side. (To see on a map, click here.) At stake in Coahuila were the governorship, 38 ayuntamientos and the state legislature. The contention for the governorship was hard-fought. The two principal candidates were Guillermo Anaya, of a coalition called Alianza Ciudadano por Coahuila (the Citizen Alliance for Coahuila), versus Miguel Riquelme of the coalition “Por un Coahuila Seguro” (For a Safe Coahuila). The Alianza Ciudadano por Coahuila coalition included four parties, the PAN, Encuentro Social, the Unidad Democrática de Coahuila and the Partido Primero Coahuila. The Safe Coahuila coalition actually included seven (!) parties: the PRI, the Green Party, NuevaAlianza, Socialdemócrata Independiente, Partido Joven, Partido de la Revolución Coahuilense and the Partido Campesino Popular. Riquelme wound up winning with 38.19% of the vote, whereas Anaya captured 35.75% of the vote, but the results were hotly contested. Guillermo Anaya asserted that the PRI-led coalition stole the election. 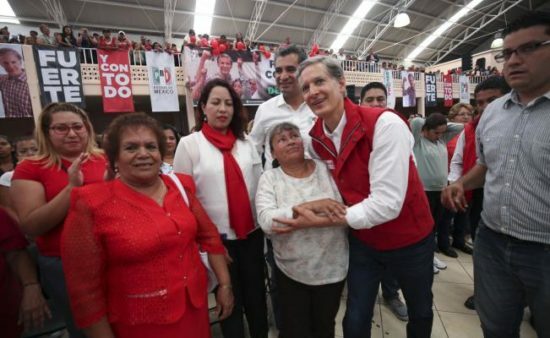 As a sort of consolation prize for the PAN, Jorge Zermeño won the mayorship of Torreon. The state of Mexico, known as Edomex (for Estado de México in Spanish) is located in central Mexico, north of Mexico City. (To see on a map, click here). Edomex has the largest population of any state in the country, and some areas of the state are actually part of the Mexico City metroplex. Edomex held a gubernatorial election. The governorship was won (with 33.69% of the vote) by Alfredo del Mazo Maza, of a PRI-led coalition also including the Green Party, Nueva Alianza and Encuentro Social. In second place, with 30.91% of the vote was Delfina Gomez Alvarez of MORENA (Movimiento Regeneración Nacional), the party founded by Andres Manuel Lopez Obrador (AMLO). In third place, with 17.89%, was the PRD’s candidate Juan Manuel Zepeda Hernandez. In fourth place, with 11.28%, was the PAN’s Josefina Vasquez Mota, who was a presidential candidate in 2012. The PRI triumph in Edomex is being contested by MORENA’s party leader AMLO.